and is in constant pain. LAST year pop singer Lady Gaga announced the cancellation of the upcoming leg of her world tour due to her ongoing battle with fibromyalgia syndrome. The news left many people asking themselves: what on earth is fibromyalgia? In the simplest terms, fibromyalgia is a chronic condition of widespread pain and profound fatigue. The pain tends to be felt as diffuse aching or burning, often described as head to toe. It may be worse at some times than at others. It may also change location, usually becoming more severe in parts of the body that are used the most. The fatigue ranges from feeling tired, to the exhaustion of a flu-like illness. It may come and go and people can suddenly feel drained of all energy - as if someone just "pulled the plug". "Once you’ve got it, you’ve got it for life.” explains Dave Williams, 51, whose wife Jackie, 47, suffers from the dehabilitating condition. "You can be in pain for 24 hours and bed-ridden for weeks on end. So many people are now being diagnosed with that the NHS is being swamped but a lot of doctors will not recognise it. "It's totally destroyed our lives to be honest - all the people we used to know before Jackie's illness we don't see anymore. "Along with the illness comes depression, anxiety and a lot of people lock themselves away and become cut off. We want to make others aware that these people need help. "Very little is known about the illness and the chemical imbalance between the spinal cord and the brain. Because of this signals are sent to nerve receptors all over the body to open to their maximum state, which in turn leads to excruciating pain all over the body along with many other symptoms." Jackie, 47, who used to work as a hairdresser, says: “It’s a very isolating illness as being in constant pain every day does get you down. 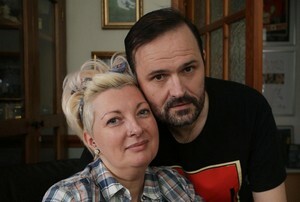 Now after leaving his job to care for his bed-bound wife at their home in Connah's Quay, Dave is determined to raise funds and awareness of the condition, as well as a drop in centre for Fibromyalgia sufferers, using his love of rock music to spread the message. For more information on Rock Off Fibro go to www.rockofffibro.bigcartel.com.